Looking at the pictures above is is instantly obvious the January health kick is in full force? Well, for one of us anyway, Ian had already had a breakfast meeting in the pub just across the road from our Cirencester office. Still, knowing that I am trying to be healthy in mind and body we took a stroll past the market place onto Castle Street, in fact you could have called it a good 10 minute walk which is quite a feat given that we must have passed at least 15 other eateries with Ian’s comment ringing in my ears let’s try ‘Somewhere Else’. I thought he was being unusually fussy until I realilsed that was the name of the place!! What a great venue, we perched on high stools at a table just opposite the bar, one of the few available seats left, and soaked up the ambience. 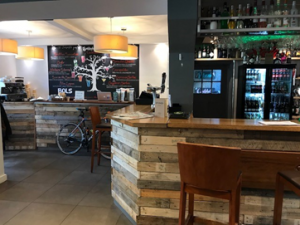 There was a pleasant energy about the place, the low hum of conversation, friendly staff and people seemed relaxed when you bear in mind most were probably on a tight hour lunch break so the turnaround from ordering your food to it being delivered to your table was really good. With a wall mural depicting a tree of cocktails and a menu offering burgers, mac & cheese and nachos to name but a few, I am proud to say I avoided temptation opting for a butternut squash and pepper salad with a side order of halloumi skewers and Ian chose ‘Eggs Norwegian’ – two poached eggs with smoked salmon on a toasted English muffin and hollandaise sauce. It was all delightful, Ian finished his plate first but I think that was because I was trying to savour all the different flavours in the salad and we were both very happy with our choices. With not one glance at the desserts displayed at the bar we hopped off the stools and headed back to the office happy that we did go ‘Somewhere Else’ for lunch!